Following an injury-marred 2013-2014 campaign, the Detroit Red Wings and their fans were ready to turn the page. While the June release of the 2014-15 regular season schedule offered a sense of renewed optimism, it was clear the team would have little room for error coming out of the starting gates with seven of the team’s first ten games coming against playoff teams from last season. Then, in the first preseason game of the year, came a heavy dose of déjà vu: Pavel Datsyuk would be out for four weeks with a separated shoulder. 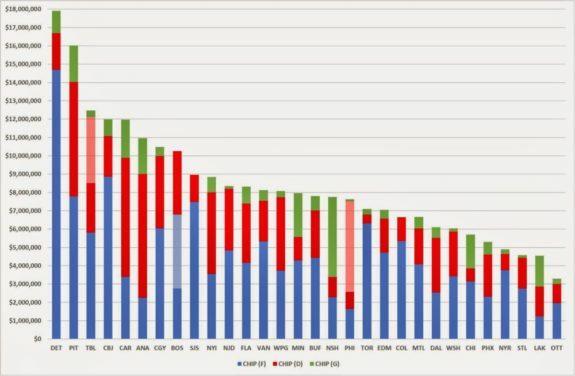 Last year Detroit was second in the league in man-games lost and first in CHIP (Cap Hit of Injured Players), a metric created by LW3H of Springing Malik to illustrate the combined value of players lost to injury. Among the profusion of injuries, the team received only half-seasons from its two best players, Datsyuk and captain Henrik Zetterberg. Seeing one of the team’s stars go down with a significant injury in the first game (not even a real game, at that) was an all too familiar scene. Red Wings fans were understandably exasperated. 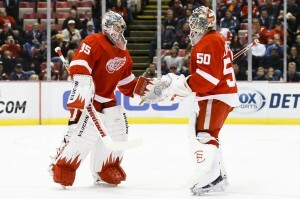 But exasperation regarding the Red Wings has quickly given way to buoyancy, in more than one sense of the word. Datsyuk has since returned and the team has managed to stay afloat by securing 10 of a possible 14 points, just two back of the division-leading Montreal Canadiens. Meanwhile, fans are beginning to believe that this year could be something special, or at least different than the injury-riddled season that preceded it. It hasn’t always been pretty, and some of it certainly isn’t sustainable, but Detroit has come out of the first seven games of the season about as well as anyone could have hoped. LW3H’s CHIP (Cap Hit of Injured Players) chart shows that the Red Wings lost more salary cap value to injury than any other team in 2013-14. It’s important to remember that seven games is hardly a reliable sample size, but it is enough to display certain trends. As far as sustainability goes, the Red Wings have been all over the map. A 100% penalty kill rate is obviously not something that can be continued, but this will probably again be an above-average unit that could crack the top 10 in kill rate (they finished in the top 12 the last two seasons). At the same time, the power play has been utterly insipid and will improve from 7.4%. How much? I’m not sure. This is a group that has been average or worse for years, with the coach often receiving the bulk of the blame. Well, Jim Hiller is the third man in charge of the power play in the last four years, and it hasn’t ranked better than 15th in that span. Maybe the team should try Brendan Smith at the point? We’ll have to wait and see, but it can’t get any worse. Right? Speaking of defense, one of the biggest questions coming into the year was, “Which Jimmy Howard are we going to get?” The answer: the outstanding one. Howard’s save percentage of .929 would be a career-high if he were to sustain it through the season, and it will probably dip, but he has produced a SV% at or above 92% in three of his five seasons as a starter. And, just as the power play and penalty kill have come close to canceling each other out (though, as noted, the PK is less sustainable), Detroit’s 8.04 on-ice shooting percentage and 93.94 on-ice save percentage will probably regress (the oiSV%, more so). And while Detroit’s special teams skew the statistics a bit, their even-strength numbers are closer to average, or even below-average. This is true of their possession statistics, and especially of their near-bottom 5v5 oiSH%, both of which will almost certainly improve. Most people weren’t really sure what to expect from this Red Wings team; that’s true even of the experts. But one thing we did know was that the schedule in the first month would be brutal. We’re now two-thirds of the way through the October games and this team has only lost once in regulation. Sure, I’m still irritated about the Anaheim game. And the Montreal game, was, well, I’ll go with “disheartening.” But things could be much worse. Successfully navigating the opening portion of the schedule (a stretch ranked 8th in degree of difficulty by Hockey-Reference) is invaluable. We shouldn’t forget that the Red Wings began last year’s nightmare 6-2. Without those points, The Streak surely would have ended; all points are worth the same in the end. Perhaps these points will prove to be just as valuable at the end of this season, but hopefully this time it’s home ice and not a playoff spot at stake. We may not have a large-enough sample size to say anything definitive about these Red Wings, but we do know that they have weathered an early season storm, and that there’s a lot to like about this team – as long as they don’t get hurt.